Words of the Wise Acres: Mmmmm....chocolate chips! I have been browsing the website at Rancho Vignola, a wholesale fruit and nut supplier and contemplating putting in an order, mostly because I want to get fair trade/organic chocolate chips. Last year, I learned a little bit about the child slave trade involved with the chocolate industry and decided I prefer to buy certified fair trade chocolate (and coffee, but that's another story). 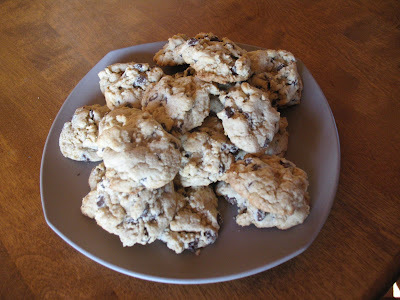 But I wondered...could I really use 10 lbs of chocolate chips....hmmm, probably! 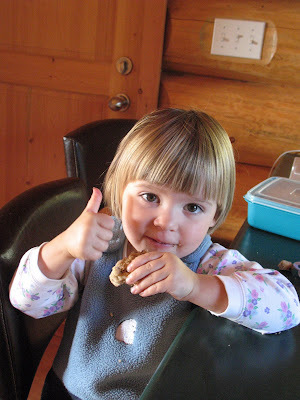 Recently, I have been making two snacks for the girls on a fairly regular basis...chocolate chip cookies for V. and banana chocolate chip muffins for G. (M. is happy with either). I'm quite happy with the recipes for both, as they use mostly clean ingredients and whole wheat flour. I find it to be a fine balance when baking for kids...to keep it healthy but still tasty. I learned my lesson when I tried to pass off whole wheat carob chip cookies to G. and she told someone "my mom really can't cook, you should taste her chocolate chip cookies!". I make it pretty much according to the recipe except I often use organic cane sugar instead of the regular white stuff. Combine dry ingredients. In a separate bowl, combine egg, oil, yogurt and vanilla. Stir these into dry ingredients. 'Fold in*' bananas and chocolate chips. 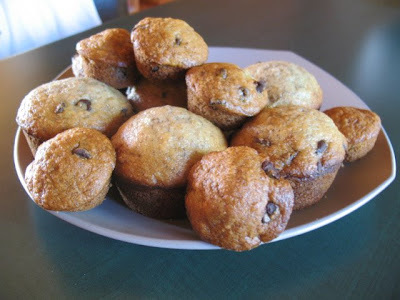 Fill greased muffin tins 2/3 full. Bake at 350 degrees for 22-25 minutes. Cool for a few minutes before taking them out of muffin trays. * I have often read this instruction in other recipes and wondered exactly what is meant by 'folding in' an ingredient. Recently, I bought this great cookbook The River Cottage Family Cookbook and they describe what is meant by folding in...basically, it's a way of adding a delicate ingredient to a thick mix or a heavy ingredient to a delicate mixture. "Unlike beating, which uses all of your arm, with folding it's the spoon and your wrist that do all the work, turning the mixture over and over like a scooping sort of paddle. For folding you use a metal spoon rather than a wooden one, because it has a thin edge and doesn't work the mixture so much. After each scoop of the spoon, give the bowl a quarter turn with your other hand - this helps to make the blending more even." M. gives these a big thumbs up! Chocolate fruit and nut clusters make great gifts too...if you can bear to part with them. The organic cane sugar from RV is nice too.